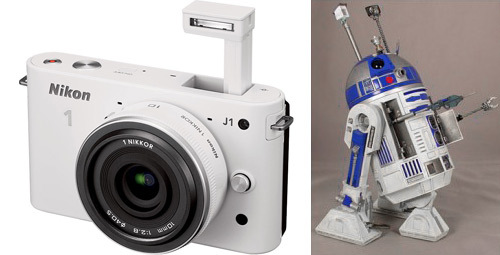 Ok. Who is going to be the first person to do a Nikon 1 R2-D2 mod? The pop-up flash on the Nikon 1 screams R2-D2. And the body on the Nikon is available in white. Are you kidding me? Are you kidding me? R2-D2 all the way! Even the rounded sides of the Nikon 1 match the shape of R2. Plus R2’s eye is black. The Nikon 1’s lens is black. I’ll suggest painting at least part of the lens blue.